Fisheries and Oceans has once again snubbed District of Kitimat Council, by refusing to appear in public before council to answer questions about key issues. 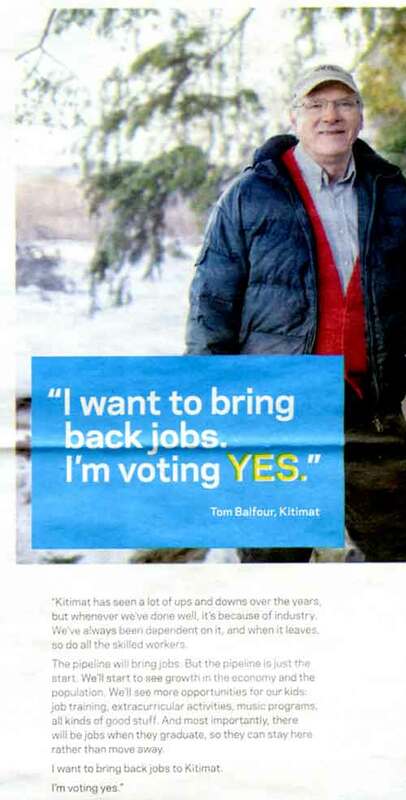 At the Monday, March 10 council meeting, the snub was on the issue of who is responsible for the Kitimat River, facing “increased usage of the riverbank during future construction periods” as well as concerns raised by council earlier over waste left by campers. In the fall, DFO also refused to appear before council when the department was asked to do so on the issue of Clio Bay remediation. 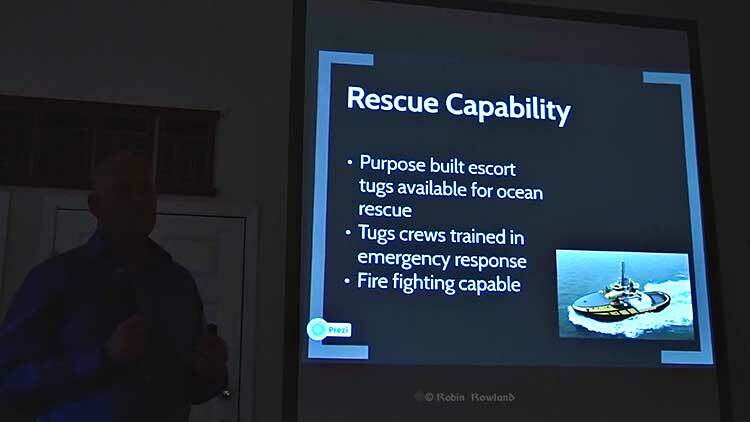 A report to Council from the District’s Deputy Administrative Officer, Warren Waycheshen, noted that district administration “was recently advised that Fisheries and Oceans are unable to participate in Council meetings, however, they will continue to meet at an operational level to provide information on DFO’s regulatory role. In other words, DFO officials will continue to meet with district staff and council, in private, but are not accountable to the Kitimat public for their actions, except through what district staff may report to council. The rest of the report consisted of quotes form the amended Fisheries Act and what appears to be a printout of a DFO Power Point presentation on how it sees its current role. 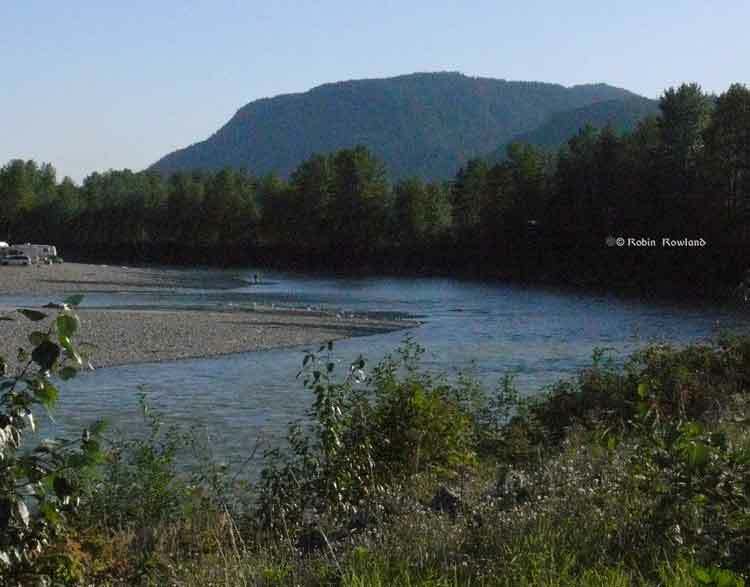 So now that the federal government appears to have downloaded responsibility to the District, the riverbank ball is now in the hands of Kitimat Council, whether or not the Council actually has jurisdiction. 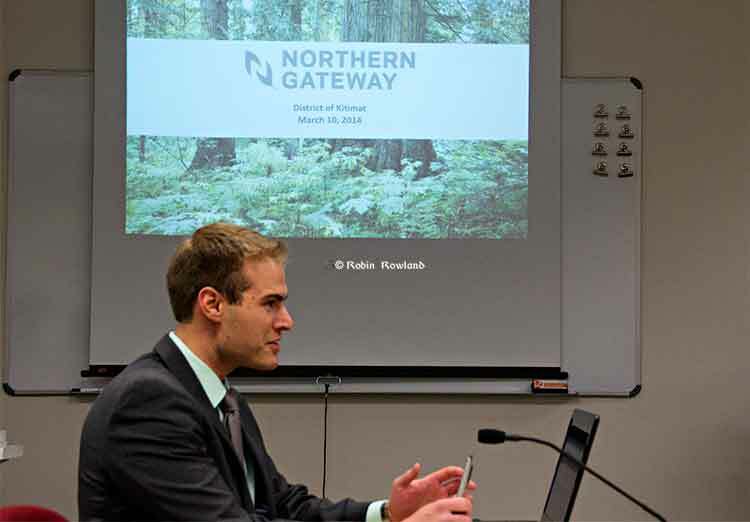 Councillor Phil Germuth presented a motion asking that District staff prepare a map showing who exactly owns the land along the Kitimat River and what that land is being used for. In the debate, Councillor Corrine Scott noted, “The first paragraph says Fisheries and Oceans won’t attend a council meeting. Fine, we’ve got that part. But then that’s it. 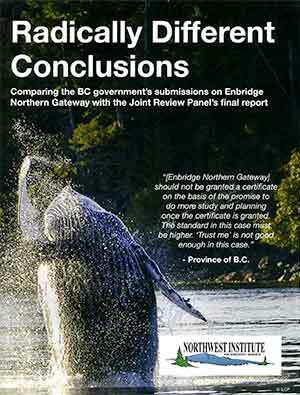 Everything else is about the fisheries protection program and policy statements and all the rest of it. But it doesn’t actually answer the question about any concerns regarding waste left by campers and whether its okay or whether we should be putting in more garbage cans or that sort of thing. 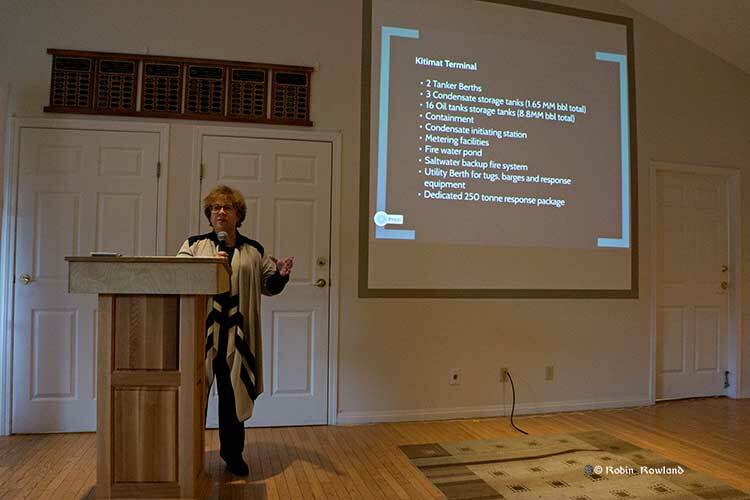 Councillors Mary Murphy and Mario Feldhoff noted that the District has done reports on how the riverbank is used. Germuth then pointed out that he wanted to know who the landowners are so if Council descies to control access to the river because, “If we put a gate up on the river, we’re not just controlling access for campers, we’re controlling access for everyone else that wants to go through. I want to know who owns the land, so if we decide to do something, we can chat with landowners. “Longer that that, I do believe,” Mayor Joanne Monaghan interjected. Germuth’s motion was carried unanimously. 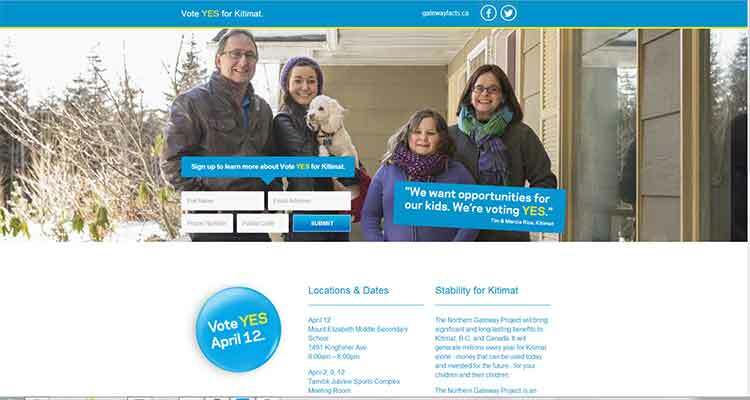 District of Kitimat Council will take another look at the Northern Gateway project plebiscite next Monday, March 3, when it considers a motion from Councillor Phil Germuth to cancel the vote altogether. 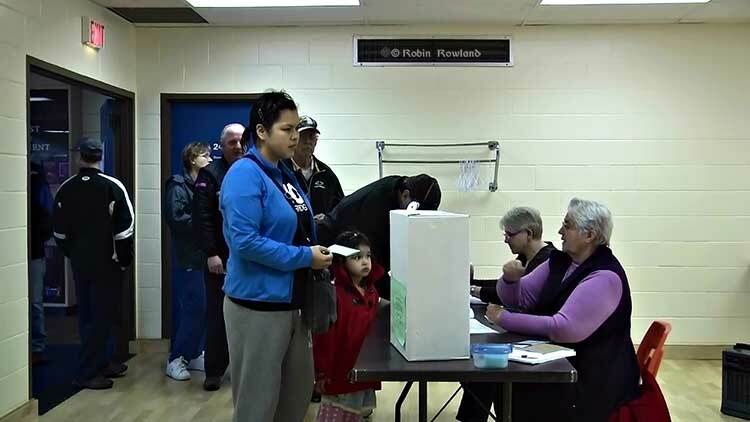 This Monday, February 24, Council voted to cancel the “undecided” option on the ballot, leaving voters with a simple yes or no question. 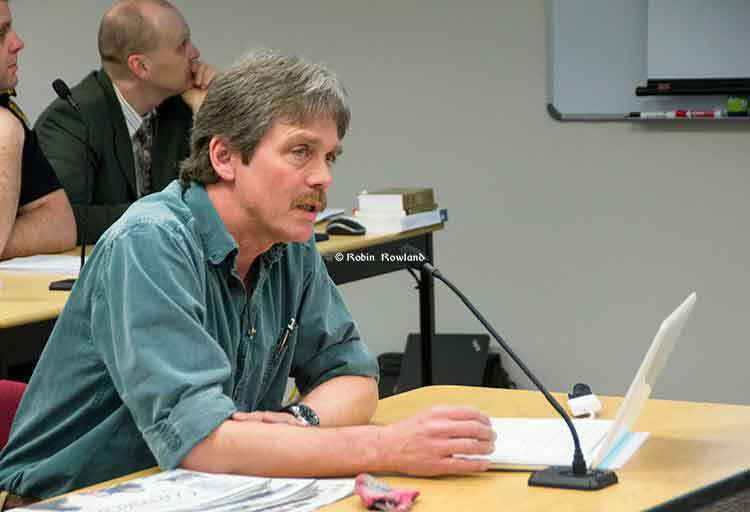 That decision costs the district taxpayers $500, since council was told by the deputy administrative officer, Warren Waycheshen that the ballots had already been printed. 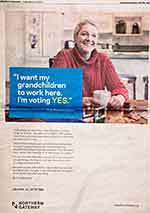 The question of whether “undecided” was still on the ballot came up as council was discussing the advertising campaign for the coming plebiscite—if it survives next Monday’ s vote. Apparently after the confusing Council session on January 20, some members of council believed that the “undecided” option had already been eliminated. “Can I get clarification on it. I thought it was going to be strictly: yes or no?” Germuth asked. Asked about the ballots, Waycheshen replied the ballots had already been ordered, but the $500 cost was minimal. He told Council that amount should not stand in their way if they wanted to amend the response to the question. Both Germuth and Mayor Joanne Monaghan said that by now everyone should now how they feel. Germuth said that leaving the undecided option might lead to misinterpreted results. District staff will wait until next Monday and the vote on Germuth’s motion to cancel the plebiscite altogether before ordering new ballots. Minchin began by rereading the plebiscite question. Minchin then gave Council some samples of what will be a longer presentation at Riverlodge on Wednesday night. 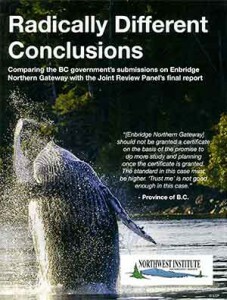 He also said Condition 169, which calls on Enbridge to file a plan for a research program on spilled oil was rather late, “far into the game,” he said, and thus an example of how the conditions had no teeth. 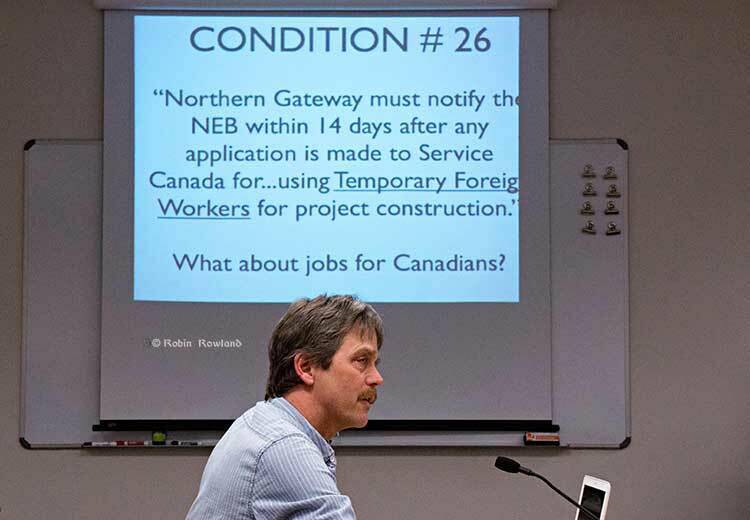 Minchin said even those who support the project should be concerned about other conditions, including one that calls on Northern Gateway to notify the National Energy Board if they plan to hire foreign temporary workers. “What about all of these jobs for Canadians which we have been hearing about since day one. 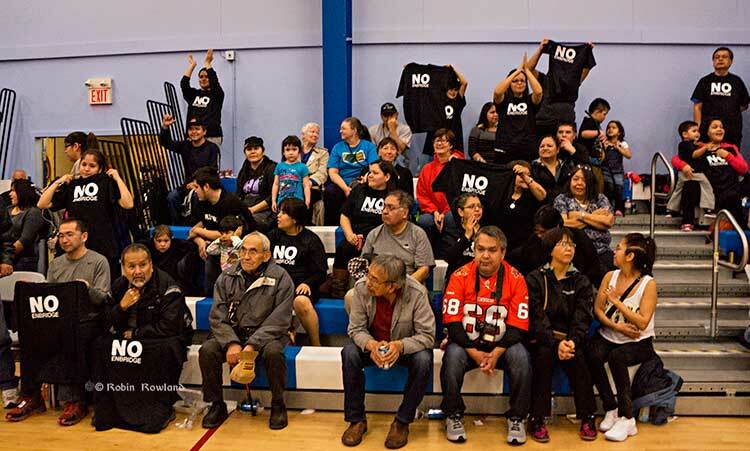 It is supposed to be a job generating project for Canadians,” he asked Council. He said the Joint Review Panel should have had conditions that there be no foreign temporary workers or that a certain percentage of jobs should go to Canadians and to people from the region. 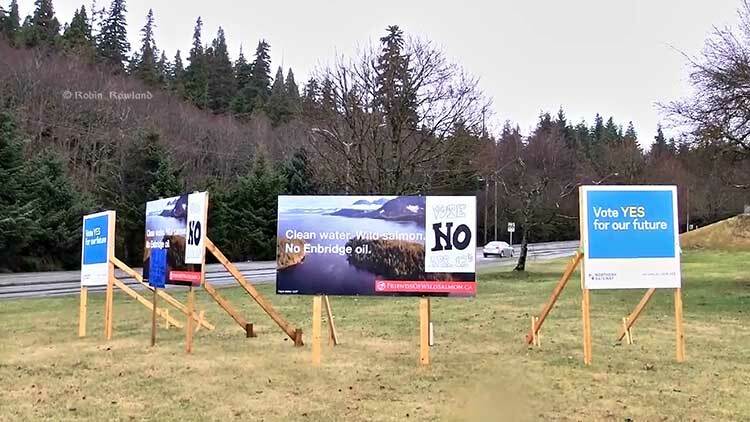 Douglas Channel Watch will be hosting what they call “a community information forum” called ‘Everything You Ever Wanted to Know About the Enbridge Plebiscite, but Were Afraid to Ask.’ –in effect a campaign for the no side,. at Riverlodge on Wednesday, February 26th at 7:00 pm. Minchin said DCW members who developed expertise in their role as a JRP intervenor will be speaking on various topics.